This EcoSoft controlled roll towel satisfies those seeking to achieve green status for their facility and purchase toweling produced with methods less harmful to the environment. 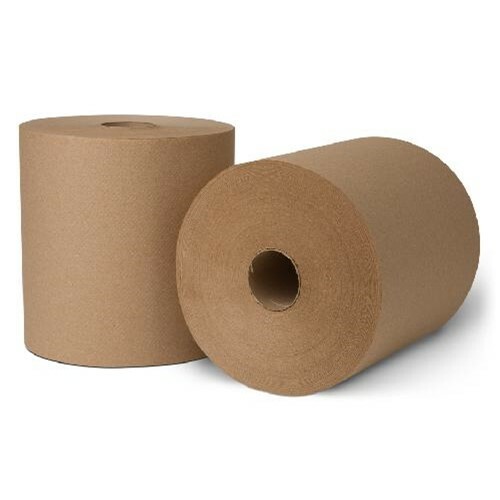 This roll towel is 100% recycled and contains a minimum of 50% post-consumer waste, which exceeds EPA guidelines. EcoSoft controlled roll towels provide added value and benefits such as usage control and cost savings when combined with Wausau Paper controlled roll towel dispensers. This quality roll towel is high-capacity is ideal for schools, universities, stadiums, and other high-traffic areas. The new 7.5 inch, 1000 foot hard wound roll towels are the frist Green Seal certified extended length roll towel on the market. They are made from 100 percent recycled fiber and exceed EPA guidelines for post consumer waste content. Designed for use in Wave n Dry, OptiServ, and OptiServ Hybrid dispensing systems. Case Size: 24" x 16" x 8"